When I first saw this game I thought back to the old school game for the Ti- Graphing calculator, and then for Facebook (that was called Mafia Wars Wars from Zanga). While those games were based around resource management and time wasting, this new version is has the same resource management underlying, however it has the twist that you can earn Steem coins, and those equate to real-world income. Once you get Your empire set up you could be earning real world Steem coins daily. The setting is you are a drug Lord trying to build an empire. The more resources you can produce, you can invest into various units and put money towards "the daily bank heist ". This then translate that into a daily Steem pay out. 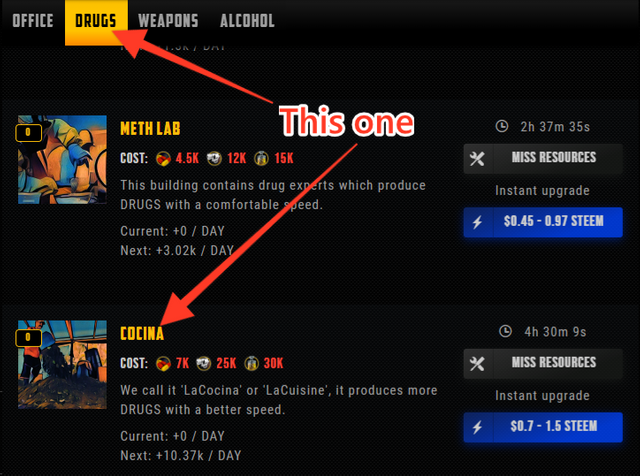 After some searching and some math it looks like the "COCINA" would be the best unit to produce as every 14 to 15 days, (should you be invest hundred percent of your production into the heist), you would pay for the building. So after day 15 you could be making potentially $0.10 a day. Here is a screenshot of the building I recommend. Of course you do have the risk of other players attacking you and stealing your production. So you have to invest into guards and other units to help protect you. However when you start the game you have a two day shield protecting to ramp up production and protection. 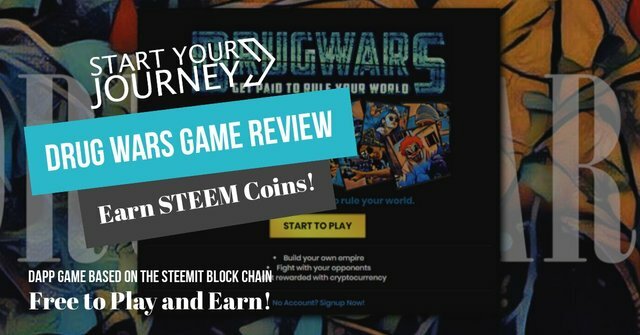 The game will ask you to link your Steemit account, (Yes its Safe) Its all done by SteemConnect which all steemit programs connect by way of. You will need is you private “active key*” found under the permissions tab in your Steemit wallet. After you connect the game, you can invest into building your empire and ramping up production to earn coins! !